Mudpuppies (Necturus maculosus) are the largest salamanders in North America. Unlike most salamanders, they can vocalize, making a high-pitched noise that some say sounds like the barking of a small dog. The most distinguishing characteristic of mudpuppies is their bushy red external gills. 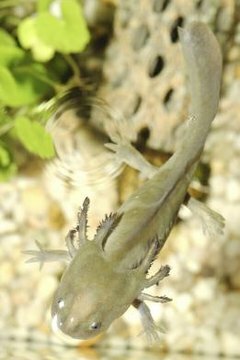 All salamanders have gills during their larval stages, but mudpuppies never grow lungs so they keep their gills and must remain in water in order to breathe. They are large, reaching a length of 8 to 15 inches, with a short broad tail, stubby legs and four toes on each foot. They are brownish grey in color with blue to black spots and yellow bellies. Mudpuppies are found at the bottom of lakes, streams, ponds and rivers throughout much of North America, in the Midwest as far north as southern Canada, as far south as Georgia and east to North Carolina. They are most often found in shallow water hiding among vegetation or rocks, although they have been found at depths of more than 100 feet in the winter months. Mudpuppies are solitary animals, only coming together briefly during mating season. They are nocturnal creatures, spending their days hiding under overhanging embankments, dense plant cover or rocks. In the evening they come out to feed. They are not picky eaters and will consume just about anything they can catch, including snails, small fish, insect larva, crayfish, worms and other amphibians. They hunt by smell, not sight, which allows them to find their prey even if it is hidden in sand or mud. They remain active all year, surviving very cold temperatures as long as the water they are in doesn't freeze all the way to the bottom. The breeding season for mudpuppies occurs in late fall, but the females store the sperm over the winter and the eggs aren't laid until spring. The female digs a shallow cavity under a rock or other object, crawls into it, turns upside down and lays the eggs -- usually between 50 and 100 of them, one at a time on the rock above her. In a show of maternal instinct that is very rare in salamanders, she stays with the eggs until they hatch in 30 to 50 days. Newly hatched mudpuppies are less than an inch long and are dark brown with yellow stripes down their sides. They remain in the protection of their mother for some time after hatching, eventually going out to find territory of their own. Mudpuppies grow slowly -- it will take the young four to six years to reach adult size. Once fully grown, their large size protects them and they can live as long as 20 years.